As part of the ongoing collaboration between the Millennium Challenge Account-Jordan (MCA-Jordan) and the Department of Statistics (DoS), 30 staff from DoS underwent a week-long training aimed to improve their data quality and respondent tracking systems. The training comes to help MCA-Jordan to measure the impact of the $275 million Compact funded by the US Government’s Millennium Challenge Corporation (MCC) that aims to reduce poverty and enhance economic growth by implementing a series of water and sanitation projects targeting Zarqa Governorate. MCA-Jordan has signed an agreement with DoS to handle all the surveys required by the Compact in order to determine the success of achieving its objectives. “We chose DoS as a business partner for their credibility and professionalism. Furthermore, the collaboration will help build the capacity of DoS staff as well as injecting new survey methods in Jordan. This training that was held by specialized international company aims to improve the data quality and respondent tracking systems for years to come, and the most important part is to train the staff of DoS on how to scientifically analyze information and assess the success of the program's activities.,” MCA-Jordan CEO Eng. Kamal Zoubi said. For his part, the General Director of DoS Dr. Qasim Al Zoubi expressed his delight in the existing collaboration with MCA-Jordan that comes in line with department’s role as a significant and established statistical body responsible of the variety of national statistical efforts. He also said that DoS seeks to continuously offer accurate statistics to the different segments of society; from policymakers, decision makers, to researchers and interested individuals. As Dr. Al Zoubi emphasized on the importance of this training mentioning that it is an opportunity to benefit from the expertise of trainers and to exchange experiences between the two parties which will reflect on the actual implementation of the training outputs, especially that they need to maintain the excellent level they have reached following the international praise they received for the successful 2015 population census. The survey work for MCA-Jordan has enabled DoS for first time to conduct both electronic surveying and a longitudinal data collection (i.e. surveying the same respondents multiple times). Previously, MCA-Jordan provided a new Java system for DoS as a better technology to raise the level of data collection. The company also offered the needed training for DoS employees to be able to use the system as well as computers and laptops for that regard. Noticing that data collection was conducted manually, consuming time and affecting quality, MCA-Jordan decided to empower the field teams with unprecedented technology in Jordan by distributing 50 tablets for them so that they can electronically gather data. 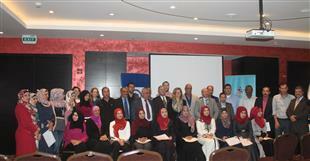 “The cooperation between MCA-Jordan and DoS has yielded substantial benefits. The exchange of knowledge, and expertise, as well as best international practices have helped to build the capacity of the teams allocated to implement MCA-Jordan’s assessments,” MCC Jordan Country Director Mr. Alex Russin said. 1.Water System Project which includes the extension of 800 km of new pipelines along with 50,000 new water meter and a new Al Basateen pump and tank station to reduce water leakage, and aimed water project to reduce wastage of 50% of the amount - 35% and increase the rate of water supply to citizens from 36 hours to 72 hours per week. MCA-Jordan has been able to implement approximately 90 % of the project until this moment.